The format will remain as Rebels versus Imperials. Early registrations and payments will receive the force they want, late comers may be asked to pick one specific side to balance things out. The tournament will be a mix of dogfights and custom missions. Round 1) A 2 versus 2 battle. Random pairings. Both fleets come on in waves. The mission plays to a normal victory condition winner. 90 minutes. Round 2) A normal dog-fight round, Imperials versus Rebels. 75 minutes. Round 3) Quick kill, you only have to kill two selected ships from your opponent to win. 60 minutes. Round 4) A normal dog-fight round, Imperials versus Rebels. 75 minutes. Names in bold have paid are are locked in for their faction of choice. The players pack is available from the Group North tournaments page. Count me in - Imperials leading the way! I was so super tempted to do it on that day but decided to stick with the time slot it's run for the last couple of times. Some of the prizes for Lightspeed - as always the winner gets the movement set. 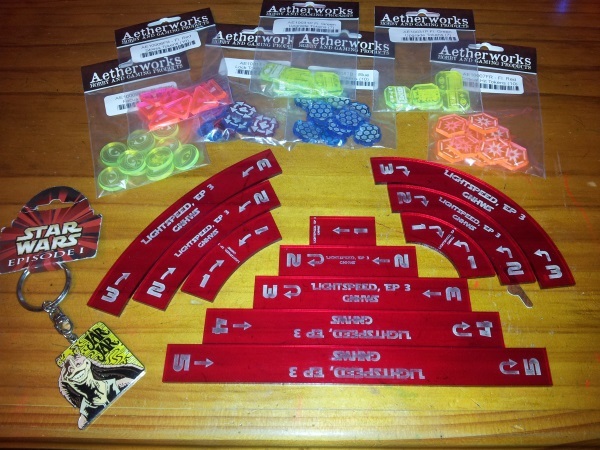 Aetherworks have donated some extra token sets for prizes; if you are after a local distributor of tokens I recommend going to their site. And of course last place has the honour of the Jar Jar Binks award. Further sponsorship details to be announced later. The players pack is now available from the Group North tournaments page. Last competition we had 16 entries - I'm hoping to make it at least 20 this time round. To prepare for this number of entries I've added an incentive to register early; entries submitted a week before the competition will enter in a draw for a random prize before the competition starts. Getting stuff just for turning up! Totally worth it. Spread the news and recruit your friends or any newly interested players. We're getting new names and eager players but that isn't an excuse for other players to not come a defend the right of the Empire to rule the galaxy, or to help the Rebel upstarts topple the order this time. Spread the word and don't forget to register here, through the Group North facebook page or direct by email to xwing@houseofholden.net. Imperial Aces are allowed in the competition, and while we probably won't see the Rebel Aces by then if the Corvette comes out the Rebel X-Wing pilots in that box will be allowed too. Lock me in for the Emperor. Remember that entries that are paid for by May the 2nd are eligible for the early bird prize. Entries will be accepted right up to the competition start time, but those that lock in earlier have a better chance of running the faction they want. I am in with Imperial. Can my son enter (he'll play rebels)? Everyone who can play is welcome! (Also those who want to learn are able to come along too - the first round is set up that you are likely to be paired up with an experienced player though you'll still have to find a fleet and have an idea of the freely downloadable rules before you turn up). How are we going out there in Lightspeed land? I hope people are spreading the word to their fellow club/store players. X-Wing has a great tournament play system and is balanced so that new players with a few ships can still enjoy playing against people with lots of games under their belt. I didn't know which one you were bringing. We now have 3-2 Imperial versus Rebel players. Given that the last Hobby Matrix event was all Rebels I'm expecting to see a few more of them turn up. I'm aiming for at least 16 players for this event. 11 is good but I know everyone can encourage their friends and spread the word at their local gaming haunts to see if we can get more in. The new tournament rules have been released by FFG. These rules are used for rounds 2 and 4 of the competition as well as the basis for round 1. In most cases the changes won't have an effect on play. The one change that will be adopted is that a major win is made if you cause 12 or more points of damage to your opponents fleet than you take in yours. In round 1 this is 24 points. Round 3 uses a custom win condition. Any officially released non-Epic ships will be allowed. This will include the Rebel Aces and the fighters in the Rebel Transport if we are lucky enough to have them released by then. There is also an updated FAQ released. How hard is it to learn xwing? Read that it's a very balanced and "quick " game and that makes me interested in it. Half-way through your first game you'll have mastered all of the core mechanics. From there it is learning how to fly so your ship ends up pointing where you want (and not being pointed at by others) and the fun that comes in constructing your fleet so they work together. The rules are very clean and simple to follow. An experienced player will normally do better against a beginner but I've never seen regular curb stomping of new players (and I've lost my fair share of introduction games too). You can find the rule book on FFG's support site and I'm sure countless "watch it played" videos on YouTube. I recommend giving the game a try. 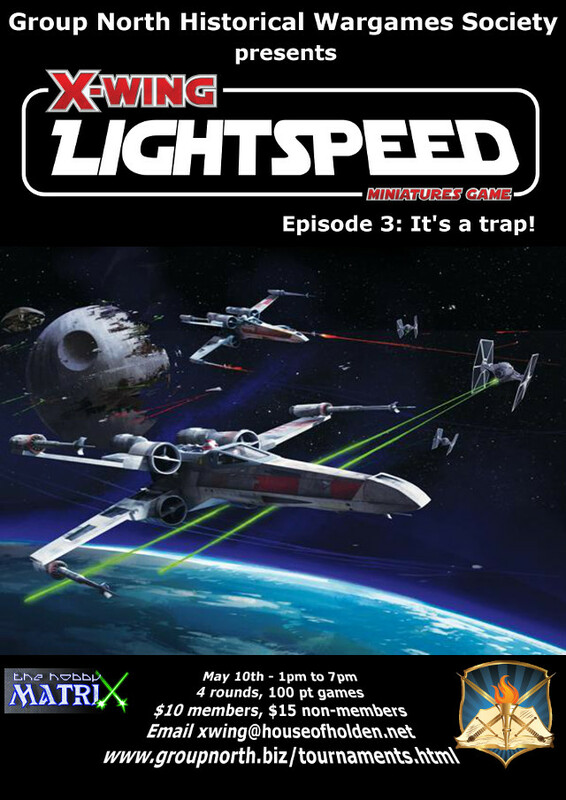 (I also recommend giving Lightspeed a try, a quick ask around will easily find a spare fleet to play with and the first round of this tournament will see every working in pairs so you'll have an experienced eye to help you learn the finer details of the game). Thanks to The Hobby Matrix sponsorship I can announce a $25 store gift voucher prize for the top two places and $15 for places three and four. A $20 voucher will be raffled between all entrants who register and pay by May 2nd. These are in addition for the movement templates for first place and the bonus token packs from Aetherworks for the winning side. And the Jar Jar Binks award. A reminder that entries in by this Friday (2nd) are eligible for the pre-registration raffle. Plus we may see the Rebel Transport floating around by May 10th and Porkins will be allowed to fly. This could be a good chance to test out some new and interesting builds. Impossible ? Hold my beer and watch this!